Oxidants, Antioxidants and Impact of the Oxidative Status in Male Reproduction is an essential reference for fertility practitioners and research and laboratory professionals interested in learning about the role of reactive oxygen species in sperm physiology and pathology. 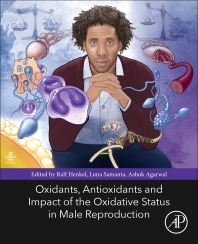 The book focuses on unravelling the pathophysiology of oxidative stress mediated male infertility, recruiting top researchers and clinicians to contribute chapters. This collection of expertise delves into the physico-chemical aspects of oxidative stress, including a new focus on reductive stress. Furthermore, the inclusion of clinical techniques to determine oxidative stress and the OMICS of reductive oxidative stress are also included. This is a must-have reference in the area of oxidative stress and male reproductive function. Professor Henkel has expertise in male reproductive health - specialty: Andrology. He is a visiting reproductive scientist at the Cleveland Clinic. He studied Biology and Chemistry at the University of Marburg, Germany, and obtained his PhD investigating the protein secretion of rabbit blastocysts during early pregnancy. Dr. Henkel is currently Senior Professor for Reproductive Biology at the Department of Medical Bioscience at the University of the Western Cape, Bellville, South Africa. He has published more than 90 papers, contributed to nearly 30 books, and is a member of the Editorial Boards of five international journals and Editor-in-Chief of Andrologia. His specialty is male reproductive health, including male infertility, sperm functions, impact of oxidative stress on sperm functions, DNA fragmentation and fertilization. Dr. Henkel investigates the effects of Traditional Medicine on male reproductive functions and the prostate in cases of prostate cancer and benign prostatic hyperplasia. Luna Samanta received her Ph.D. in 1999 from Utkal University, India. She first served as Assistant Professor in Biotechnology at Orissa University of Agriculture and Technology, India and subsequently as Assistant Professor in Zoology and Biotechnology at Utkal University, India. Luna was appointed as an Associate Professor of Zoology at Ravenshaw University, India in 2010. In 2014 she was promoted as Professor and Head of Department of Zoology. Currently she is the Dean, School of Life Sciences at Ravenshaw University. Luna was a Commonwealth Academic Fellow at the Institute of Reproductive and Developmental Biology, Imperial College London during 2012. She was also the recipient of Government of India’s Raman-Post-Doctoral Fellowship and had worked as a visiting scientist at the American Center for Reproductive Medicine at Cleveland Clinic, USA. Luna is the recipient of several awards, such as the Young Scientist Award by Indian Science Congress Association, Young Scientist Award of Orissa Science Academy and KK Nair Prize for outstanding Research Publication by University of Kerala, India. She has published over 45 scientific papers and reviews in peer reviewed scientific journals, authored over 8 book chapters and edited 2 books. Luna is active in both teaching and research and to this date 5 Ph.D and 19 M. Phil students have been awarded their degrees under her supervision. Her current research interests are focused on identifying the biological markers of oxidative stress, DNA damage, apoptosis and autophagy using proteomic research tools and bioinformatics analysis as well as environmental impact assessment using redox markers with particular reference to male reproductive functions. Luna is actively involved in laboratory and clinical studies assessing the efficacy of certain antioxidants. Dr. Agarwal received his PhD in 1983 from Banaras Hindu University, India. He did his post-doctorate training in Reproductive Biology under a fellowship from The Rockefeller Foundation at Harvard Medical School. He was an Instructor in Surgery and then an Assistant professor of urology at Harvard Medical School from 1988 to 1992. He was appointed in 1993 by the Cleveland Clinic Foundation as the Head of the Clinical Andrology Center, which over the years under his leadership, has become a center of excellence in the United States for the diagnosis of male infertility and fertility preservation of men with oncological conditions. He is the recipient of over 100 research grants. His current research interests include studies on molecular markers of oxidative stress, DNA integrity, and proteomics in the pathophysiology of male and female reproduction, effect of radio frequency radiation on fertility and fertility preservation in patients with cancer. Dr. Agarwal is actively involved in laboratory and clinical studies looking at the efficacy of certain antioxidants in improving the fertility of male patients. He has published over 500 scientific papers and review articles in peer reviewed scientific journals, authored over 100 book chapters, and presented over 800 papers at both national and international scientific meetings. He has edited 18 medical text books/ manuals related to male infertility, ART, fertility preservation, DNA damage and antioxidants. He is the guest editor of 4 special journal issues. He is a member or office bearer of several professional societies including: American Society for Reproductive Medicine, American Society of Andrology, American Urological Association, Society for the Study of Male Reproduction and Society for the Study of Male Reproduction and Urology. Dr. Agarwal is active in basic and clinical research and his laboratory has trained more than 500 basic scientists and clinical researchers from the United States and more than 50 countries.